The furious clangor of battle. The harrowing singing of steel. The desperate cries of wounded animals. The gasps of bleeding, dying men. The slow, deep breathing of terrible things--trolls, giants, draugr--waiting in the darkness. The wolf's wind howling, stalking like death itself. The carrion-crows, avaricious and impatient, circling the battle-ground, the Raven's Table. The skald's voice, low, canting, weaving tales of fate and heroism, battle and revelry. Of gods and monsters, and of the women and men that stand against them. Of stormy Scandinavian skies and settlements upon strange continents. Of mead-hall victories, funeral pyres, dragon-prowed ships, and gold-laden tombs. Of Ragnarok. Of Valhalla. For a decade, author Christine Morgan's Viking stories have delighted readers and critics alike, standing apart from the anthologies they appeared in. 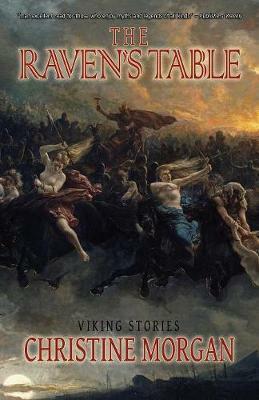 Now, Word Horde brings you The Raven's Table, the first-ever collection of Christine Morgan's Vikings, from "The Barrow-Maid" to "Aerkheim's Horror" and beyond. These tales of adventure, fantasy, and horror will rouse your inner Viking.